I had a lot of questions about a black box I use in almost every drum synthersizer demo. 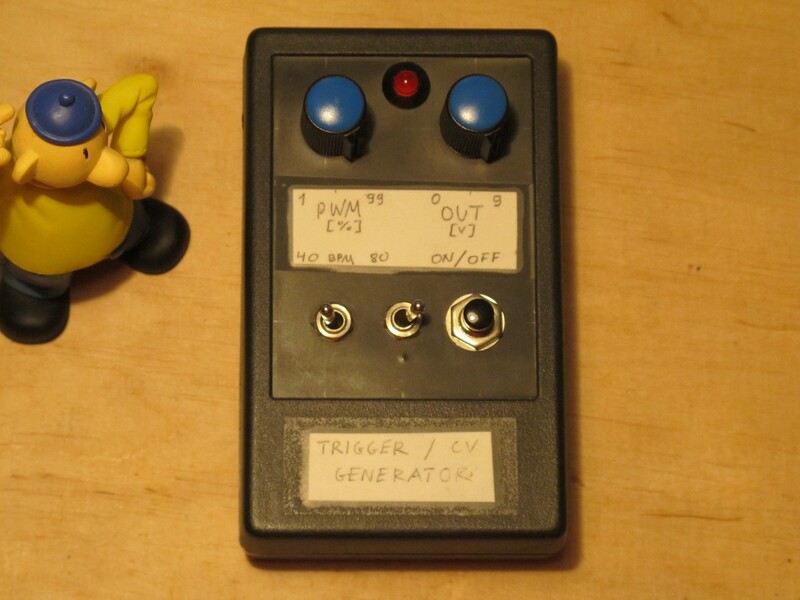 This device is just a simple 555 trigger generator, very useful in everyday synth DIY. The question is: what advantage it has over a function generator? even if you fry it, replacement parts cost nothing. how drum synth responds to different trigger pulse widths and levels – is there a retrigger or loss in sound fatness. The device is based on 555 in constant frequency pulse width controller application, used often for LED brightness or DC motor speed control. 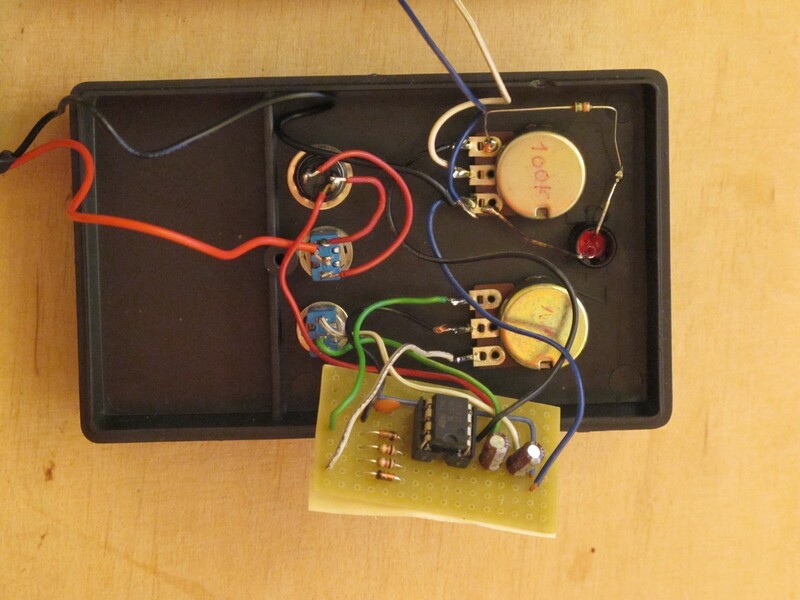 Because it is so simple, you can build it on breadboard in minutes (or even solder components directly to front panel potentiometers / switches / jacks). There are 2 potentiometers (for pulse width (PW) and output LEVEL) and 3 switches (power on, 1-shot generation and frequency (FREQ)). Jack output is very handy as you can use standard audio cables. C1/C2 are timing capacitors and set a generator frequency to around 1,25 Hz for 2 uF (C1||C2 – FREQ switch closed) and 0,63 Hz for 1uF (only C2 connected – FREQ switch opened). D1, R1, R2 and part of PW pot sets the charge path. D1, rest of PW sets the discharge path for C1/C2 capacitors. R2 sets the minimum positive pulse time to over 2,0 / 3,5 ms depending on FREQ switch position. R3 with LED gives you a visual feedback about current PW and FREQ settings. The LED current is set to ~3 mA. LEVEL potentiometer sets the amplitude of the generated signal, from 0 V to around 7 V (assuming circuit is powered from 9 V battery). Finally, two ON/OFF switches let you choose the triggering method – maintained gives you a constant waveform generation, momentary (usually) a single pulse shot. All parts are popular and easy to source, you should be able to build one way below 5 euro in less then 1 hour. Squarewaves, mostly. Oscilloscope screenshoots shows all you can get from this device. frequency is more like 50 / 100 BPM. I have no words. I really sucked at DIY. Jack socket is glued to enclosure. PCB is flying in the air. Nothing is protected against shortcut. And wires are way to long. You will do better for shure. I bet I used my teeth to cut this PCB. Considering the quality of parts I used, soldering and everything else, it is a big suprise it works over 5 years now. And I use it almost everyday! This little guy is very helpfull in DIY struggles, build one and you won’t regret it! 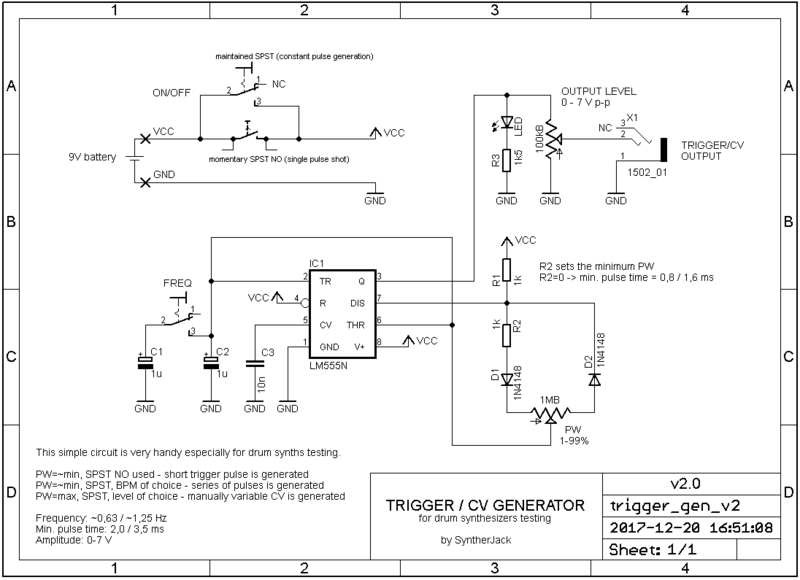 I know “standard” trigger pulse for eurorack is 10 V, 10 ms. 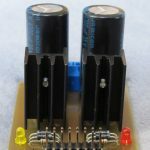 This generator gives 7 V, which is ok to make 99% of modules work. Hey this is really cool little project. 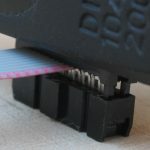 I am currently experimenting with piezos and I was thinking of booking one up in stead of the manual trigger. Any idea what I would need to change to integrate the piezo into the project? 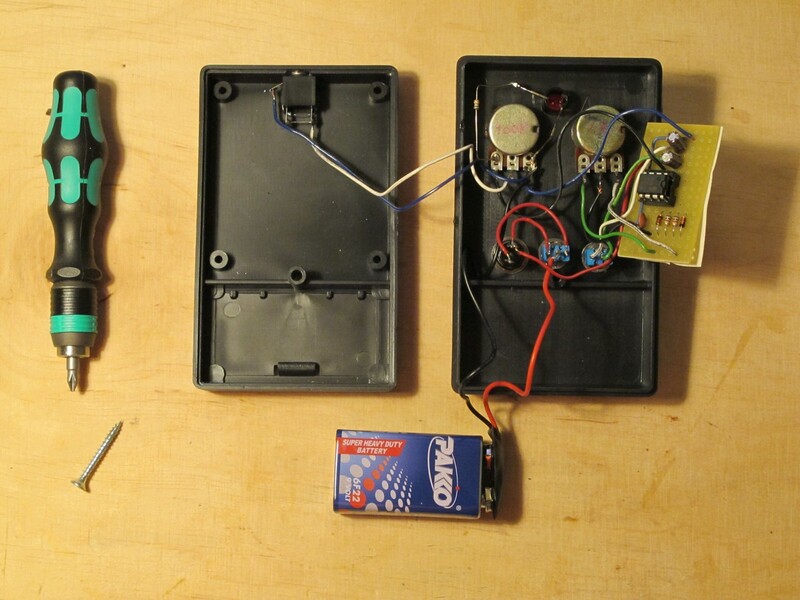 And would it be possible to use the velocity from the piezo trigger as well? 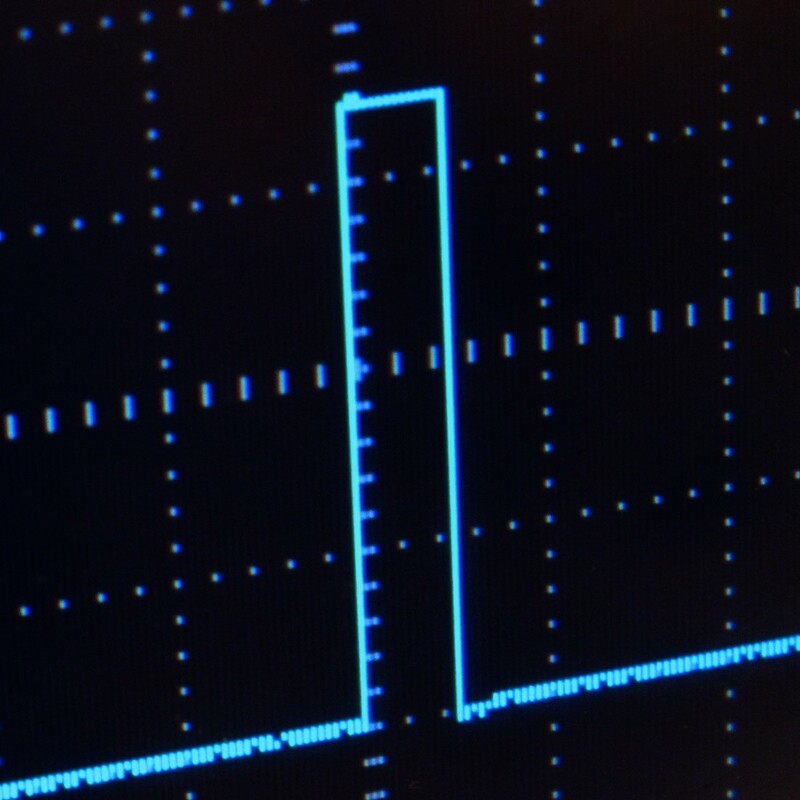 Also I am not getting rectangular pulses on my scope from this build.. the led seems to indicate that the pwm is working however what I get on my scope looks more like a segment of a sine wave with a complex timbre, nothing like the images you are getting. Any tips?